As you can see there is a lot of liquid that assembles at the sides. This lasagne has bechamel and marinara sauce. The bechamel is reduced, with a chunky (but watery) red sauce. The lasagne pages were boiled and drained (but not pat dried). 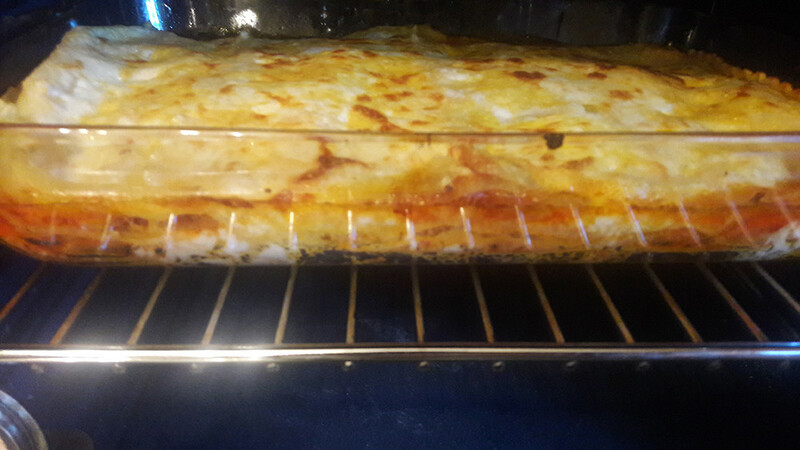 What could be done to reduce the liquidity of the lasagne and make it more gooey and stable? Moisture comes from several source. Meat, cheese, sauce, noodles (if preboiled). There a variety of things you can do to address each of these. As mentioned in my answer to your previous question, letting the lasagna rest prior to service will help. So too, using dry noodles, without boiling, will cause the noodles to absorb some of the liquid, leaving you with a still firmer result. To deal with 'water'(or myoglobin) from the meats, brown the meat separately and thoroughly so as to 'boil off' these liquids. For moisture coming from the sauce (tomatoes, broth, wine...)allow your sauce to simmer longer before adding it to the lasagna dish. Again this 'reduces' the sauce and will leave you with less liquid at the end. Cheeses, choose well aged cheeses over some of the cheaper alternatives. (Ricotta over cottage, real mozzarella over that pregrated stuff in a bag, etc.) these cheeses are 'relatively' drier and will leave you with less liquid at the end. On more thing... if you still want to tighten up your lasagna some more, add a quarter to a half cup of panko to the sauce just before you begin to construct the lasagna. This will help absorb some of that moisture as well. When I bake a lasagna, I begin with the pan covered with foil. 350 - 375F for 45 minutes. Then remove the foil. Bake another 15 -25 minutes so that the surface browns and edges crisp. Remove from the oven. Rest for 30 - 45 minutes (this is critical for your specific question). Portion and serve. If you still find the end product runny, reduce the amount of condiment in the lasagna. If the sauce is to wet. I add some dry fine ground cheese to absorb the extra water in the sauce. Cheaper sauces seem to be more water. Also dry spice added will absorb some. Not the answer you're looking for? Browse other questions tagged pasta italian-cuisine lasagna or ask your own question. How do I keep my zoodles from being too watery? How do I impart the flavor of mint to a tomato sauce?